Last summer Jenn and I spent almost a week in Tenerife, one of the islands that makes up the Canary Islands, a Spanish Autonomous Community. Tenerife is a pretty amazing island and has lush greenery and farms on the North half and dry desert-like areas in the Southern half. It's a very popular location for European tourists and most of the Southern half seemed to cater to British tourists in particular. We rented a car and drove around as much of the island as we could, seeing the volcano park, and lots of different beaches that came up every few miles along the coastline. The two menu items we encountered most frequently were Sangria and these wrinkly potatoes with mojo sauce. The Sangria was far better than any we had had here in the States and I may have to tackle that sometime as well. The wrinkly potatoes are very simple and didn't blow us away but I found myself missing them and wanted to take us back to our sunny getaway and forget about all the cold weather and snow we've had here around NYC. They are supposed to be wrinkled and have a slight salty crust to them and are usually served with a tangy, spicy sauce. 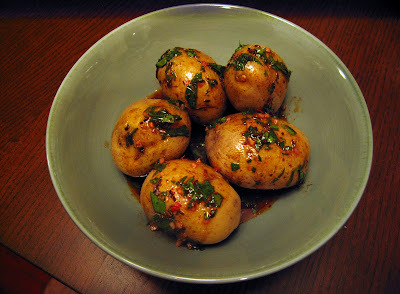 For these potatoes, you basically just boil them in very salty water, I used about 2-3 tbsp of sea salt in water that just covered the potatoes and boiled them for maybe half an hour, until they were soft enough to stick a fork in them easily. Then you pour out the water and let them dry, wrinkling the skin and revealing the salt. I probably could have used more salt and less water for more of a salty crust but they wrinkled nicely. The mojo sauce was a little more complicated. I found this recipe here that I used because I felt I could get these ingredients easily and make this work. I didn't measure these exactly but wisked the oil and vinegar together and then added the other ingredients and wisked them in as well. The result wasn't too close to what we had in Tenerife as what we had there was always a little thicker and and more finely blended but the taste seemed correct. I might try it in a blender, if I get one, next time. Either way, for a little while it took us back to our lovely vacation when we didn't have a care in the world and it was very nice. I'd never heard of this before--it looks tasty! I'm saving the recipe to try sometime. This looks delicious and like it would really spice up plain old potatoes... thanks for sharing! I will have to try it!